"I overheard a cop telling someone to dump me in Gundya gorge"
Mangaluru : "You Muslims always need Hindu girls ? Didn't you intend to take her to Ponnani for conversion ? Beef eaters like you should not be believed... Police abused me this way and then pushed me into the station godown where they stripped me and thrashed me indiscriminately. They gagged me with socks and plastered my mouth, in the process three of their lathis broke, they also tortured by giving me electric shock." 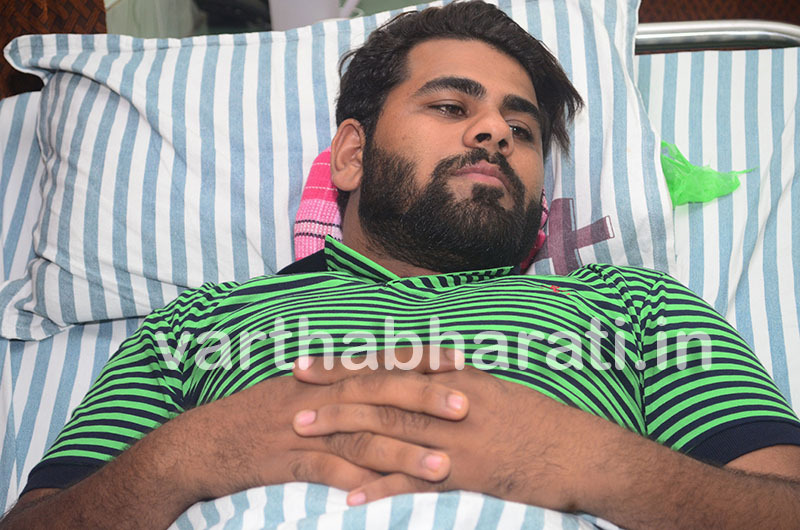 This is how Farveez alias Pachhu Bellare who was reportedly subject to atrocities by Subrahmanya police station personnel on December 21, narrated his plight to this reporter at a private hospital in Mangaluru where he is admitted for treatment . "No one should suffer the way I have suffered. Those who tortured me are unfit to serve the Department. Along with the cops two auto drivers too tortured me. All of them must get stern punishment," demanded Farveez. Speaking to Vartha Bharathi, he said he produces regional language albums and was in Tamil film industry since two years. He also said that he knew the Mysuru based actress with whom he was seen in a lead role in the film "Veruvathuli" set to be released soon. Farveez claims that the actress had asked him to come to Subrahmanya where she had to offer a Harake on December 20. "There is no affair between us. As she was a guest, I had picked her up from the Subrahmanya Railway Station and took her to the temple. Though she intended to return the same day, as the pooja was not complete she decided to stay back. I asked an elderly couple at the temple premises to take care of her and returned home," says Farveez. "The next morning she telephoned me at 6.30 am, her voice was feeble and she asked me to come near the temple. However, when I went there she was nowhere, but an auto stopped near me and took me to the station where I was tortured and attempts made to project me and the actress as lovers," he said. He also alleged that he overheard a cop speaking over mobile phone and telling the person on the other end to dump him in a gorge in Gundya. "The police asked me to keep my mouth shut regarding the torture lest I would be projected as a terrorist who had come to plant a bomb in Subrahmanya. After I was released, I returned home and remained silent. When the video went viral the SP has suspended three but all of the accused must be permanently suspended," he demanded.
" As I faced severe pain in my waist and leg I got myself admitted to the hospital," he said and demanded stern action against those who tortured him.